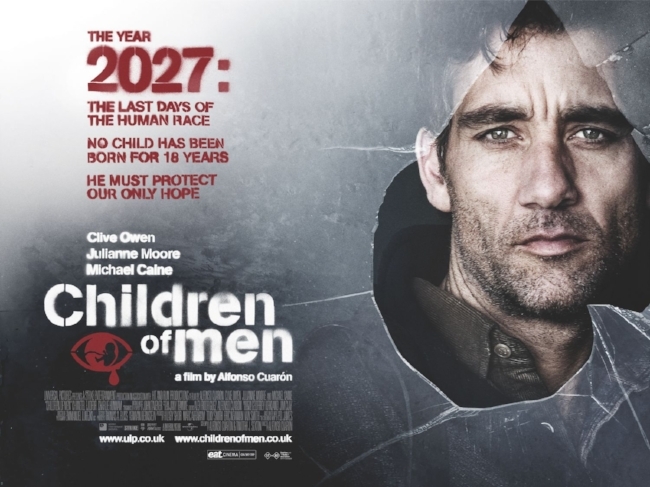 I missed Children of Men on its original release in 2006 and only caught up with recently. If memory serves, the reason the film wasn’t on my radar when it came out was due to the misleading advertising campaign which attempted to pigeon hole and market the film as a sort of post-apocalyptic thriller. Although Alfonso Cuarón's Children of Men explores a violent and dystopian future, it’s cerebral film, grounded in a tangible depiction of a future England and certainly bears little relation to the Mad Max subgenre that the publicity campaign alluded to. A similar mistake was made with the marketing of The Road in 2009 which was sold by Miramax as a post-apocalyptic action film, when it patently isn’t. In 2027, in a socially decaying world in which women have become somehow infertile, a former activist Theo Faron (Clive Owen) agrees to help transport pregnant woman Kee (Clare-Hope Ashitey) to a sanctuary. They are pursued by both the UK government and revolutionaries who seek the baby for political gain. 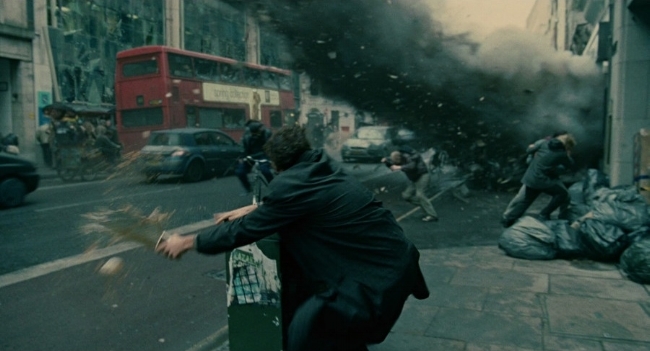 Intelligently written and credibly depicted Children of Men is a worryingly plausible tale. As the wider world crumbles, immigrants flock to the few remaining functional countries resulting in an increasingly authorisation government. Children of Men feels very contemporary indeed. The cast are capable and have ample material to work with. Michael Caine's performance was very engaging and it’s a shame that his character does not a have more screen time. It’s always good to see established actors playing against type. Caine allegedly drew on his experiences and friendship with John Lennon. Cinema often uses the depiction of technology to establish its futuristic credentials. In the case of Children of Men implies that the technological advance of recent years has ground to a halt, due to the ongoing economic and political decline. What is shown in the way of futuristic technology is subtle and effective. The heads up display on car windscreens is both plausible and non-invasive. The use of small form factor PCs and screens is also credible. Much of this aspect of the production design is a clever extrapolation of hardware that we currently have at our disposal. The overall effect helps create a more convincing and grounded depiction of the near future. 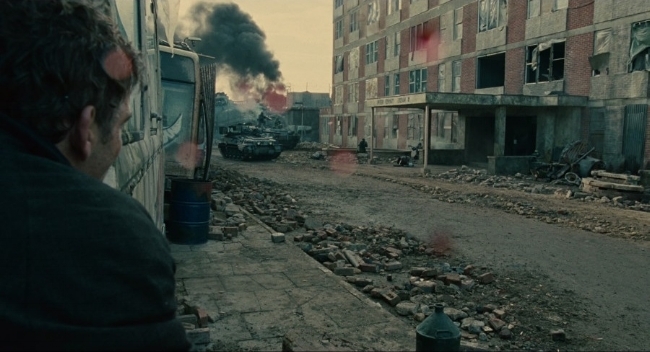 Similarly, the depiction of urban decay in Children of Men is particularly well done. The images of a graffiti ridden, boarded up and burnt out Greater London has an uncomfortable similarity to Gaza or the shanty towns of Zimbabwe. The resulting lawlessness of the disenfranchised was also very well done, especially in light of the London riots of 2011. The trains and buses with wire mesh over the windows, along with the banditry of the Kent countryside have their roots in current global civil unrest. There was similar imagery of social decline in the 1979 TV series Quatermass. The much praised "single take shots" are suitably engaging, although to facilitate such scenes, a high degree of digital post production work was required. However, in other respects the visual effects work is very low key and does not overwhelm the story, as so often is the case these days. The military assault on the refugee camp at Bexhill looks like a news report, shot on the move complete with shaky cam. It is a fascinatingly chaotic set piece and a welcome change to the usual overblown kind of Hollywood action sequence. The subsequent bombing of the camp by the RAF is seen through fog at a distant and is far more dramatic for it. Presenting the drama in such stark terms and avoiding spectacle, further elevates the movie from simple entertainment to serious drama. As you would expect from serious movies of this nature that chooses to pursue a more grounded approach to the subject matter, there are few concessions made to populist conventions such as the “happy ending” or good prevailing over evil. Therefore, the ending does not come as a major surprise and is not out of place. Considering the large amount of religious symbolism and imagery in the film, it would have been erroneous to expect anything else under the circumstances. There's sufficient information supplied in the final five minutes of the film for the viewer to draw their own conclusion as to the chain of events that would potentially follow after the films ending. Cuarón is not a fan of excessive plot exposition and comprehensive back story. A philosophy that I often agree within the context of cinema.